Carnival Cruises Funship 2.0 upgrades includes all sorts of food, fun, and entertainment. A wide variety of new spaces and places get added all over the ship as each boat in turn goes into drydock. The new Breeze didn’t have to wait for a drydock to get upgrades, it just had the 2.0 venues built right in from the start. 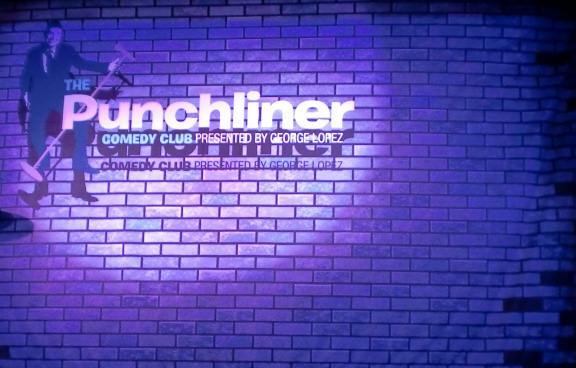 The Punchliner Comedy Club in the limelight lounge is just one of the new ways for passengers to enjoy their cruise. It has a variety of shows with two comedians booked at a time. Both do family-friendly shows, late night adults only shows, and the comedy brunch. The adults only show offers anyone easily offended a chance to leave before the shoe starts. Anyone too easily offended probably would do best to stay away from comedy shows in general, and these are no exception. We went about half an hour early hoping to find a good seat. The previous show hadn’t quite ended, so we stood in the doorway a bit with the growing crowd until it did. Not everyone got up and left as the show ended, but enough did that everyone standing there got a seat. The rest filled quickly, so arriving early definitely turned out for the best. We chose a show time that had a short show from each comedian rather than the typical longer show from just one. That way we got to sample a couple very different comedic styles. Both did find a few audience members to pick on interact with. Luckily neither chose me this time. (One did last year). Some people enjoy the limelight, but I’m more the melt in the shadows type. Warning: Don’t sit near the front at comedy shows if you want to insure the comedian leaves you alone. The laughs started before the actual show this time. A screen dropped out of the ceiling seemingly on its own. George Lopez, sponsor of the Punchliner, came on screen with a hilarious rendition of the show’s rules. When he finished the screen disappeared back where it came from and the show began. While not every member of the audience enjoyed each and every joke, enough found humor in each on that the laughs didn’t stop until the second comedian left the stage. This entry was posted in Breeze, Carnival, Shipboard Life and tagged Breeze, Carnival, comedy. Bookmark the permalink. Comedy is a difficult one. If it’s really good, there’s precious little better. If not, well, best left along but it sounds like you got a good average of laughs this time. Some of the comedians were better than others, but they all seemed to get at least some of the audience to laugh.